Note:This measurement procedure is intended to measure U-jointsworking angles only, not constant velocity (CV) joint or couplerassembly working angles. Vehicle trim heights are within specificationguidelines.The vehicle exhibits no signs of aftermarket modificationsthat may affect driveline working angles.The vehicle exhibits no signs of accident damage which mayaffect the position of the drive axle, or axles, the propellershaft support bearing, if equipped, or the transmission or transfercase, if equipped. The front working angle-(1) is formed by theintersection of the transmission or transfer case output shaft andthe prop shaft.The rear working angle-(2) is formed by theintersection of the prop shaft and the drive axle pinion. No U-joint working angle should be equal to zero. An angle of0-degrees will cause premature U-joint wear due to alack of rotation of the needle bearings in the U-joint.No U-joint working angle should exceed4-degrees.Prop systems containing only 1-U-joint: TheU-joint working angle should be within the range specified in thisprocedure.Prop systems containing 2-or3-U-joints: The 2-U-joint angles each formedwith the prop shaft that contains 2-welded yokes aredesigned to cancel each other during operation. 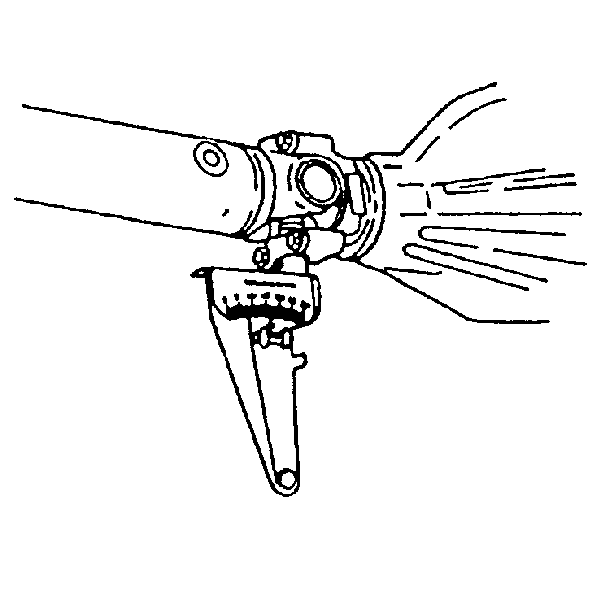 These2-working, or cancelling U-joint angles should be equalto each other within the range specified in this procedure provideeffective cancellation of the U-joints.Prop systems containing 3-U-joints: The U-jointangle formed by the prop shaft that contains only1-welded yoke is an odd, or non-cancelled angle. Thisworking angle should be within the range specified in thisprocedure.Always orientate theJ-23498-ADriveshaft Inclinometer, or equivalent so that it faces the same side of thevehicle for each measurement taken. 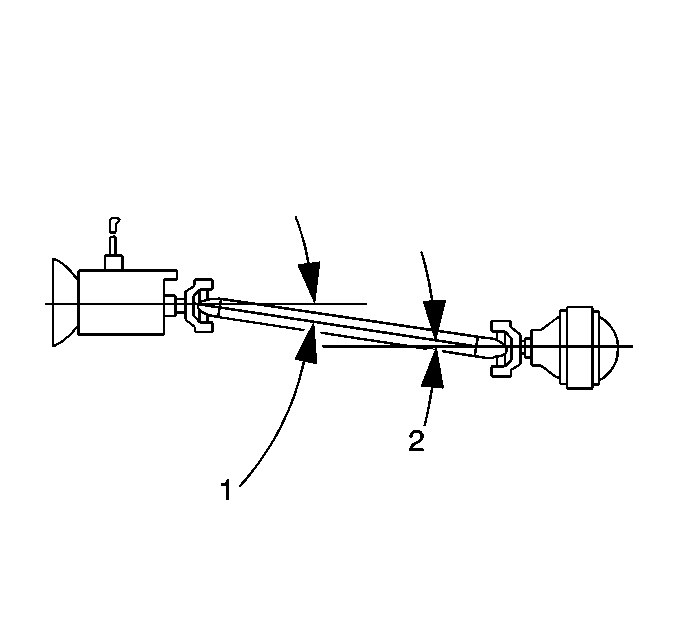 Note:If it is necessary to use theJ-23498-20Driveshaft Inclinometer Adapter, or equivalent adapter, first verify the accuracy of theJ-23498-20Driveshaft Inclinometer Adapter, or equivalent by inspecting the angle of an accessiblejoint using theJ-23498-ADriveshaft Inclinometer, or equivalent, then inspecting the same joint angleusing theJ-23498-20Driveshaft Inclinometer Adapter, or equivalent. For vehicles with solid axles, ensure that the vehicle has afull tank of fuel or the equivalent amount of weight in the correctlocation to simulate a full tank. The weight of 3.8-L(1-gal) of gasoline is approximately 2.8-kg(6.2-lb).Raise and support the vehicle. On vehicles with solid axles,ensure that the drive axle is supported at rideheight—vehicle body supported by suspension components.Suspension travel will not affect driveline angles on vehicles withdirect-mounted drive axles. Ensure the wheels are free to rotate.Refer toLifting and Jacking the Vehicle.For vehicles with 2-piece prop shaft systems, inspect thelateral alignment of the propeller shafts before proceeding:From underneath the propeller shafts, look down the length ofthe shafts from front to rear. Inspect the alignment of the shaftsto each other.From underneath the shafts, if the propeller shafts are notaligned to each other in a straight line, then the lateralalignment of the prop shafts needs to be adjusted beforeproceeding. The propeller shaft support bearing assembly can be relocatedslightly to one side in order to improve the alignment of theshafts. Ensure that you do not create a ground-out conditionagainst the exhaust or any other component. Place the transmission in NEUTRAL.Clean any corrosion or foreign material from the U-jointbearing caps.Remove any of the U-joint bearing cap snap rings that mayinterfere with the correct placement of theJ-23498-ADriveshaft Inclinometer, or equivalent . Without rotating the prop, install theJ-23498-ADriveshaft Inclinometer, or equivalent to the lower U-joint bearing cap of theforward-most, vertically-aligned yoke. This yoke may be part of aprop shaft, transmission output shaft, or a transfer case outputshaft. Measure and record the angle of the shaft. Without rotating the prop, install theJ-23498-ADriveshaft Inclinometer, or equivalent to the lower U-joint bearing cap of theforward-most, vertically-aligned yoke. This yoke may be part of atransmission output shaft, or a transfer case output shaft. Measureand record the angle of the shaft. 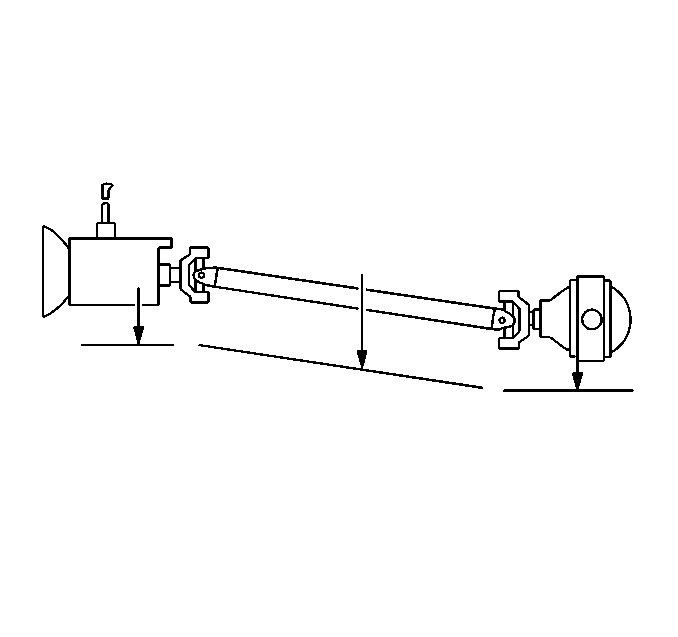 Remove theJ-23498-ADriveshaft Inclinometer, or equivalent .Install any U-joint bearing cap snap rings that were removedprior to installing theJ-23498-ADriveshaft Inclinometer, or equivalent .Calculate the U-joint working angle at each intersection oftwo shafts. Subtract the smaller number from the larger to obtain theworking angle. For example: If the drive axle pinion has an angleof 16-degrees and the connecting propeller shaft has anangle of 13-degrees, then the working angle of thatintersection is 3-degrees. Prop systems containing 3-U-joints: The odd, ornon-cancelled U-joint working angle should be between1/10-and 1/2-degrees.Any working angle that is not within the specificationguidelines requires adjustment.